A regular breeding resident and migrant; the Swainson’s Hawk was rare during the Minnesota Breeding Bird Atlas (MNBBA). The Swainson’s Hawk is primarily a raptor of the grassland biome in open country of western North America from northern Mexico to central Alberta and Saskatchewan. In Minnesota, it is sparsely distributed in the western and southern regions. Highest densities are patchily distributed in eastern Colorado, western Texas, southeastern New Mexico, southeastern Idaho, and southern Alberta (Figure 1). Assigned a Continental Concern Score of 12/20 by Partners in Flight; designated a Species in Greatest Conservation Need by the Minnesota Department of Natural Resources. A long-distance migrant that spends winters in the pampas of Argentina. A variety of vertebrates, including mammals, birds and reptiles, and large invertebrates, such as grasshoppers. Hunts by soaring or perching, or often on the ground. Typically places nest in a grove of trees or occasionally a solitary tree in open country, usually near the top. Breeding distribution and relative abundance of the Swainson’s Hawk in North America based on the federal Breeding Bird Survey, 2011–2015 (Sauer et al. 2017). Roberts (1932) labeled the Swainson’s Hawk a “summer resident throughout the western part of the state.” Presumably, the species was uncommon to common in western and southern Minnesota from the mid-1800s to the 1930s. Roberts (1932) noted observations in semi-open country east to the Mississippi River. He included comments by M. A. Hewitt in Faribault County in southern Minnesota from 1898: “Fairly common. Breeds.” In northwestern Minnesota, he said, “Peabody and Langevin consider it quite common in the Red River Valley.” He led a trip there in June 1928, where they observed 14 Swainson’s Hawks from Polk County to the Canadian border. Roberts (1932) included 4 confirmed nesting records, each with eggs, from Jackson County (1901), Polk County (1920 and 1921), and Traverse County (1879). Decades later, Green and Janssen (1975) described the Swainson’s Hawk’s summer distribution as “scarce except in the eastern part of their range” in Minnesota because most summer observations and modern breeding records were from southeastern Minnesota in Dakota, Goodhue, Olmsted, and Dodge Counties. This reversal of its distribution is odd because Roberts (1932) had emphasized that “it was only an irregular spring and fall migrant in the eastern part, if it occurs there at all.” Green and Janssen outlined a distribution confined to a narrow band along the western border with North and South Dakota, along the southern tier of counties bordering Iowa, and in the southeastern counties previously mentioned. Several years later, Johnson (1982) summarized 27 nesting records that were known in the state, from the 1879 Traverse County record to a 1981 nesting record from Dakota County. These records included a mix of nests with eggs or young, but many were inferred from observations of nests without documentation of whether eggs or young were observed. He included nesting records from 14 counties, including the farthest-north record of nesting, in Polk County from 1920 and 1921. Johnson concluded his summary with a brief discussion of the possibility of confusing a Swainson’s Hawk with a Red-tailed hawk, and of the lack of knowledge, due to this confusion, about whether the species is expanding its range in Minnesota. In 1987, Janssen described the Swainson’s Hawk’s distribution as the west-central and southwestern areas of the state and in portions of south-central Minnesota north to Dakota, southern Washington, and Wright Counties. He included a breeding distribution that was very similar to that previously described by Green and Janssen but slightly wider along the border with the Dakotas. He emphasized that the species’ breeding status north of Clay County was unknown but that there were summer observations throughout the northwest, including in Kittson and Marshall Counties. He documented nesting in 12 counties since 1970. Martell et al. (1998) added 16 nesting records from 1981 to 1996 that ranged from southwestern Minnesota, north to Kittson County, and southeast to Dakota and Filmore County. In addition, they conducted intensive searches for nesting Swainson’s Hawk in 1996 -1997 and recorded 28 locations. The locations were all in the southern portion of the state and ranged from Pipestone, Lac Qui Parle, and Stevens Counties in the west to Washington and Winona County in the east, the latter is the easternmost county where the species has been recorded nesting in the state. Hertzel and Janssen (1998), using their nesting criteria, included 7 additional counties since 1970 with confirmed nesting: Fillmore, Kittson, Lincoln, Murray, Red Lake, Waseca, and Washington. The Minnesota Biological Survey (MBS) has recorded 86 breeding season locations for the Swainson’s Hawk during county surveys (Minnesota Department of Natural Resources 2017). The MBS records were largely focused in southwestern Minnesota, especially in Lincoln, Lyon, Murray, Pipestone, and Rock Counties, and included a cluster in Dakota, Goodhue, and Rice Counties. The remaining locations were scattered in many counties, from Olmsted County in the southeast, to southwestern Todd County, and northwest to Kittson, Polk, and Red Lake Counties. The MNBBA observers identified 63 records of the Swainson’s Hawk, with a breeding distribution very similar to that previously described by Johnson (1982), Janssen (1987), and Hertzel and Janssen (1998) (Figure 2). One extension was a probable nesting in southern Sherburne County; in addition there was possible nesting evidence in Chippewa, Pope, Renville, Stearns, and Swift Counties in southwestern Minnesota. Swainson’s Hawk was recorded in 1.2% of all surveyed blocks (58/4,740) and 1.8% of priority blocks (41/2,337) (Figure 3; Table 1). Nesting was confirmed in 3 blocks, with 1 each in Dakota, Lyon, and Yellow Medicine Counties. The MNBBA also recorded possible nesting north of Clay County in Norman, Polk, and Marshall Counties. Bechard et al. (2010) reviewed the Swainson’s Hawk in North America. They did not identify any major breeding range changes in North America but noted the extirpation of breeding populations from coastal southern California and the presence of a winter population in the Sacramento–San Joaquin River delta since 1990–1991. Bechard et al. (2010) described major declines of the species since the late 1800s and early 1900s. They cite an 1882 observation by E. E. Thompson [Seton], who considered the Swainson’s Hawk “abundant” as far east as Winnipeg, Manitoba. The decline of the species was largely attributed to human persecution, because most settlers considered the species a “chicken hawk,” but the decline was also attributed to decreases in habitat and food availability due to plowing of grasslands. In North Dakota, Dyke et al. (2015) described the Swainson’s Hawk’s distribution as throughout much of North Dakota except for the Red River valley. They suggested that early human settlements may have increased the availability of nest sites in some areas, such as in shelterbelts. However, the destruction of native prairie likely affected ground squirrel populations in North Dakota and resulted in decreased food availability. In the past in Minnesota, the Swainson’s Hawk was largely confined to the open grasslands and prairie regions where suitable food supplies and nesting trees were located. The general distribution is likely similar today, but the overall population has declined substantially. In some areas, clearing of forested areas for agriculture since the 1930s in south-central, central, and southeastern Minnesota may have opened additional breeding habitat; these are areas where recent nesting has or may have occurred. Green (1981) noted the species appeared to be expanding into central Minnesota. The breeding distribution of the species currently includes the adjacent southeastern region of Manitoba (Manitoba Breeding Bird Atlas, Bird Studies Canada 2017). It is also possible that efforts to determine its distribution have been inadequate in many of these areas. Breeding distribution of the Swainson's Hawk in Minnesota based on the Breeding Bird Atlas (2009 – 2013). Summary statistics of observations by breeding status category for the Swainson's Hawk in Minnesota based on all blocks (each 5 km x 5 km) surveyed during the Breeding Bird Atlas (2009-2013). Summary statistics for the Swainson's Hawk observations by breeding status category for all blocks and priority blocks (each 5 km x 5 km) surveyed during the Minnesota Breeding Bird Atlas (2009-2013). Bent (1961) simply described Swainson’s Hawk as “a bird of the wide open spaces, prairies, plains, and deserts.” Dyke et al. (2015) described preferred habitat as open grasslands interspersed with scattered trees and shrubs. These include a wide variety of grassland types, including short-grass, mixed-grass, and tallgrass prairies, riparian areas, isolated trees, shelterbelts, pasture, cropland, and wetland borders. The species typically nests in areas with scattered trees within grasslands, shrubland, or agricultural landscapes, often in a solitary tree along riparian areas, in shelterbelts, or on abandoned homesteads (Figure 4). Martell et al. (1998) in Minnesota found Swainson’s Hawk primarily nesting in shelterbelts, woodlots, and lone trees in or near agricultural areas. They found 11 nests in cottonwood, 7 in ash, 2 in box elder, and 1 each in spruce and red pine. Dyke et al. (2015) stated that nests in trees near roads were less successful than nests away from well-traveled areas, which suggests sensitivity to human disturbance. Bechard et al. (2010) reported that Swainson’s Hawks now commonly breed in areas of intensive agriculture, especially in alfalfa fields. Therefore, the species does not seem to be susceptible to impacts from grassland fragmentation. Typical breeding habitat of the Swainson’s Hawk in Minnesota (© Gerald J. Niemi). Partners in Flight (2017) estimated a North American breeding population of 540,000 and only 200 individuals in Minnesota. In comparison, North Dakota had an estimated breeding population of 60,000 adults (Dyke et al. 2015). The most representative federal Breeding Bird Survey (BBS) (Sauer et al. 2017) trend estimates for the Swainson’s Hawk were for the Prairie Pothole Region (277 routes), the Shortgrass Prairie Region (123 routes), and the Central BBS Region (701 routes). The trends indicated a stable, a significantly increasing (1.51% per year), and a stable population trend from 1966 to 2015, respectively. (The Central BBS Region is shown in Figure 5.) Rosenberg et al. (2016) estimated a 35% increase in the species’ population from 1966 to 2014. 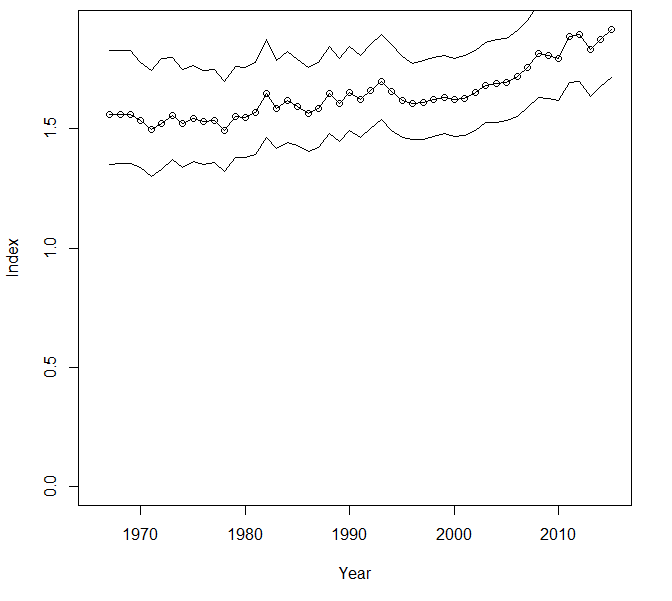 The Raptor Population Index (Brandes et al. 2017; Crewe et al. 2017) suggested that western populations of the Swainson’s Hawk have increased since the mid-1980s and significantly since 1995. Increases have been detected primarily in the Rocky Mountains and the Intermountain region (Farmer et al. 2008). In their intensive study areas in southern Minnesota, Martell et al. (1998) estimated nesting densities of 0.021 nests per square km and spacing between nests ranging from1,41 to 6.47 km. Breeding population trend for the Swainson’s Hawk in the Central Breeding Bird Survey Region for 1966–2015 based on the federal Breeding Bird Survey (Sauer et al 2017). The Swainson’s Hawk has been assigned a relatively high score of 12/20 by Partners in Flight (Rosenberg et al. 2016). It is listed as a Species in Greatest Conservation Need in Minnesota (Minnesota Department of Natural Resources 2015) due to concerns over habitat loss and changes in prairies and agricultural landscapes. The Swainson’s Hawk was also listed as a Species of Conservation Priority in North Dakota because of reduced abundance compared with the 1800s. The U.S. Fish and Wildlife Service has identified the Swainson’s Hawk as a bird of Conservation Concern. They list it in their Region 6 and in Bird Conservation Region 11. The species is listed as a species of concern in many western states and as threatened in California. North American population levels have declined since the 1800s and early 1900s due to declines in one of the hawk’s primary prey species, Richardson’s ground squirrel (Spermophilus richardsonii), habitat changes in grasslands and prairies, and mortality on its Argentinian wintering grounds due to pesticide applications (Bechard et al. 2010). Many other factors contribute to mortality, including nest predation by American Crows and Great Horned Owls, electrocution from power lines, and potentially negative interactions with Red-tailed Hawks. The extent of interspecific competition is unclear and may be related to habitat changes that favor Red-tailed Hawks. Despite benefits derived from Swainson’s Hawks’ predation on mammals (e.g., ground squirrels and pocket gophers) and grasshoppers, shooting of the birds continues in grassland and agricultural regions of North America, during migration in Mexico and Central America, and during winter in South America. During the DDT era, Swainson’s Hawks were not known to be greatly affected, but organophosphate pesticides applied in agricultural lands of Argentina reduced wintering populations in the 1990s. Over the past 20 years the population has recovered in much of their range, though California populations still appear to be low in comparison to those in the mid-20th century (Farmer et al. 2008). Given the conversion of native grassland and prairies to agricultural and other uses in Minnesota, it is highly likely that breeding populations and the distribution of Swainson’s Hawks have declined over the past 100 to 150 years. Modern agricultural practices have reduced the availability of nest sites, foraging areas, and prey. Langham et al. (2015) and the National Audubon Society (2015), in their analysis of climate change effects on over 500 bird species in North America, projected a 77% loss of their breeding range by 2080 across western North America. Continuing changes in habitat caused by a variety of factors remain the greatest threat to populations of Swainson’s Hawk (Bechard et al. 2010). Bent, Arthur Cleveland. 1961. Life Histories of North American Birds of Prey, Part 1. New York: Dover Publications, Inc.
Dyke, Steve R., Sandra K. Johnson, and Patrick T. Isakson. 2015. North Dakota State Wildlife Action Plan. Bismarck: North Dakota Game and Fish Department. Green, Janet C. 1981. “Summer Season (June 1 – July 31, 1980).” Loon 53: 132–147. Martell, Mark S., Serena Willey, and John Schladweiler. 1998. “Nesting and Migration of Swainson’s Hawks in Minnesota.” Loon 70: 72–81.